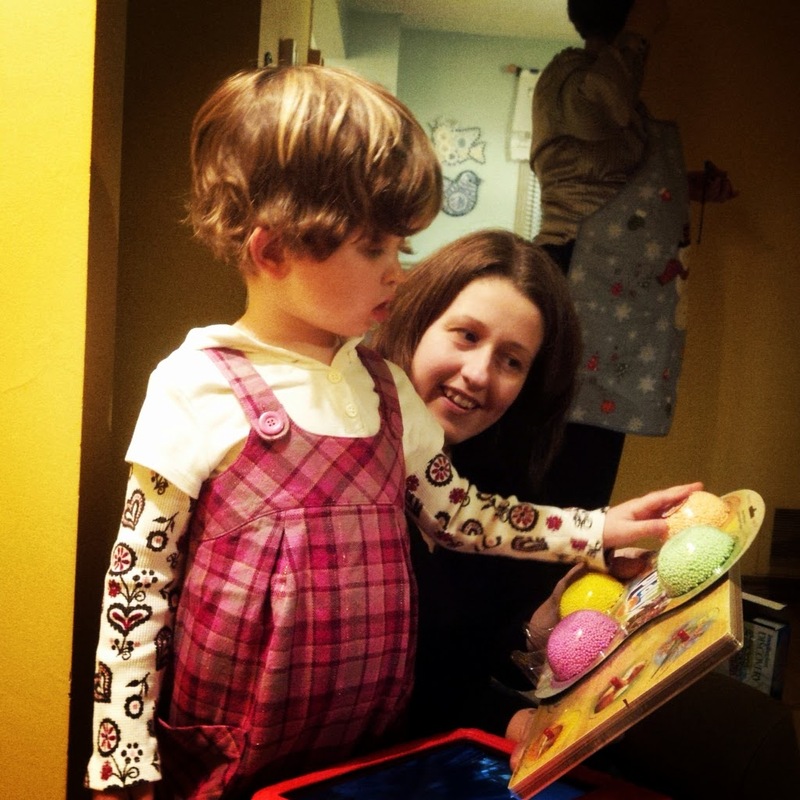 Story of Sophie, a little girl who is autistic, loves Thomas and is teaching her mom new things every day. I really should be studying for finals. But yet my brain is swirling with so many things I'm thinking about, I might as well spill that out first to make space for all the stuff I need to remember. The funny thing about feelings, is that they don't hit you at a convenient time. Like when you're sitting down, not doing much at all and thinking "I could really use some deep feelings to resolve right about now". Nah, all you'd get then is random musings about your dinner plans or a memory of some awkward thing you did in middle school and is of no significance now. But, when there is a really not good time for feelings to emerge, like say two weeks before Christmas and smack in the middle of finals that's when they're sure to pop up, like "hey I know you're really busy and stuff, but here's some emotional crap to work through. You're welcome". Or perhaps that's just how the mind works- when it's going well, it's going well, but when one thing breaks down, it all breaks down. I've been so busy lately. Final projects, final assignments and much more focus on therapy (through my studies) than we ever focus on in our daily life. Admittedly, it's a bit of a conflict of idealogies when you have to consolidate what you are learning through school with what you know of being an actual parent of a child with a disability- it's not as clear cut as presented in school. In our classes we are dealing with a lot of idealogies and theory while life seldom fits such a neat little box. Yes, these are all great therapy ideas and they have the potential to work really well... unless you have a kid who thinks they're a complete waste of their time and they are not willing to humour you or your brilliant strategies and good luck trying to convince them otherwise. Would I happen to know a kid like this you ask? Perhaps a cheeky little lady springs to mind. I also know that sometimes these "difficult" children do have a valid point. Why should they be working so hard really to try to catch up to some arbitrary goal which doesn't have much tangible meaning to them? Oh, we know exactly why, but try selling them that story. And I guess this sort of brings me to the feelings part of the whole story. As feelings do though, they are rarely linear so might not make as much sense here as they do inside my head. Last week, we received Sophie's IEP report. We were expecting it, but seeing pages (and pages) of Sophie's perceived deficits was still a punch to the gut. The thing about these reports is that they are based on data- I know all about data as I studied data taking and report writing extensively this semester. We were told that if "it isn't recorded, it didn't happen". However, what is recorded is very, extremely narrow. In terms of data, information is clinical and concrete- did the child (or client, as we are to refer to them) attain the target objective? What percentage of the time? Do the goals need to modified (either made harder, or simplified). Where is this on the report? There is no place on the report for supplementary information about this little client- what is she like, what does the time spent with her look like? What makes her laugh and be silly? What does her family love about her? How significant really are the deficits in her daily life? What strategies has she so brilliantly developed to go around some of them? I read this Facebook post by one of my favourite bloggers. She examines this concept a lot and it always hits home. Especially the part about having to do it to her, and not her siblings. How awful would our typical children feel if their report cards only stated negative things about them? Yet their feelings are spared by a perpetually-positive spin on even areas they need to improve upon (my son for example "sometimes manages to be organized and remember homework assignments on time". ahem). Our disabled children of course are assumed not to be able to read their reports and so they are written for the purposes of the therapists, teachers and random bureaucrats which might happen to read them. Which might be a fair assessment, but yet is another way our children our excluded. Why shouldn't they get reports in which teachers painstakingly turn everything they do into a skill and a learning objective? I have stacks of my older kids' kindergarten reports and while they couldn't read them either, they were saccharine-sweet and encouraging. Were they meant to be encouraging for me then? Why shouldn't Sophie's report be? Questions is all I have, don't ask me for the answers. Of course, I know the purpose of these reports. They are a gateway between our kids and services. A concrete piece of evidence to wave at an administrator and say "look! my child has trouble transitioning 5 out of 5 days! She needs more support, her teachers need more support!" Parents of disabled children know their kids are disabled, we know where they "lack". My hopes are not for her to miraculously stop being disabled all of a sudden. 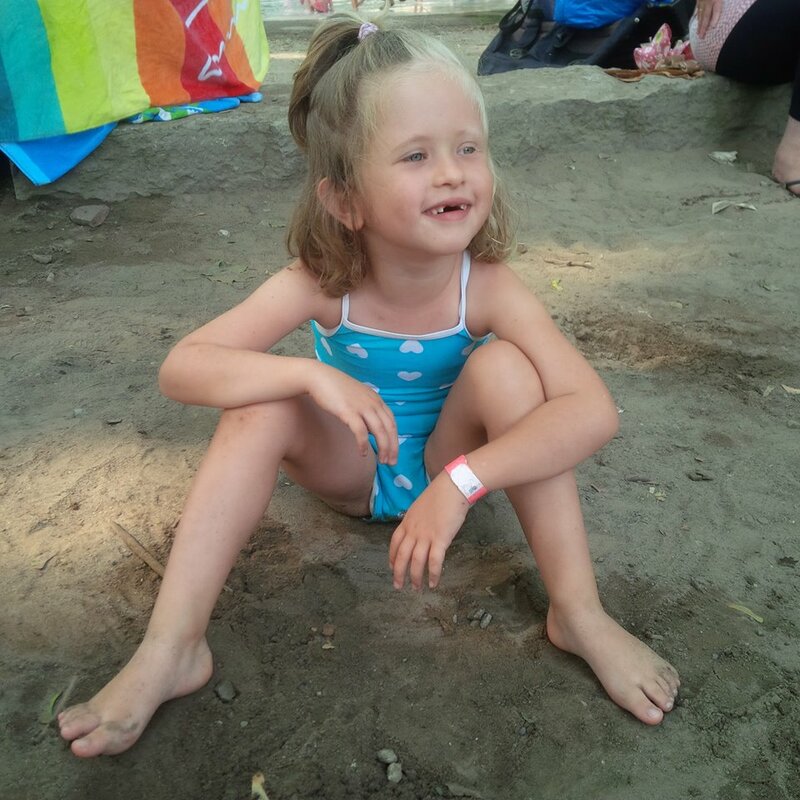 But what I would like for her to have is a place where she is seen as Sophie- a little girl, who is sometimes stubborn, often willful, who prefers to do what she wants (really, what 5 year old doesn't?) but who is so, so loved and makes her family so proud. Who has come such a long way and learned many things that might not be measurable in terms of percentages but which are a testament to her cleverness and problem solving. It's not just the IEP- it serves its purpose presents a quantifable summary of Sophie in an educational setting. It's witnessing the subtle (and not so subtle) differences in how she is treated compared to her typical peers- constantly measured, analayzed, evaluated and always coming up short. Feelings though, they're not measurable and they don't contribute anything meaningful to the situation. If I can leave a parting thought to this rambling mess is- take the reports with a (big) grain of salt. Don't let them distort how you view your child. File them under bureaucratic exercises and put those "not yet able" phrases out of your mind. You know your child best and she is so much more than what's in those reports. Is it inappropriate to begin every blog post apologizing for not blogging for so long- again? Yes? Then I won't do that. In the whirlwind that our life has been of late, with me going back to school after 12 years at home with the kids, husband taking over most of the daily child care duties (he's doing amazing) and the kiddies all in their respective schools, life has been busy, busier than ever before. But, amongst all this chaos there is excitement. Soaps has had a real "explosion" of AAC communication after a rather bleak several months, communication-wise. 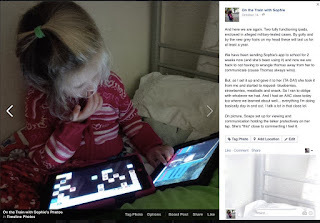 First a tiny recap- this was the post where I first expressed how frustrated I was with our current system and how limiting I felt it was for Sophie's current and future needs. Since then most of our readers know Sophie has been using the app Speak for Yourself to communicate, with varied success. Seriously varied- like tapping out a five-word phrase within the first week of getting the app to completely going on a communication strike for a long and sad several months. That's the enigma of Sophie. 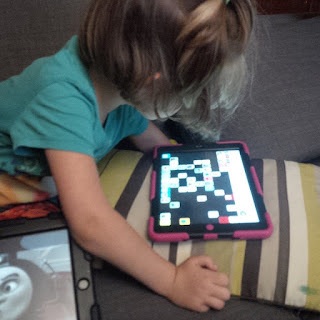 The mechanics or access to the app never seemed to be an issue- she was always able to physically use it. However I must admit that there was a few months I began to worry that perhaps her issue was language-based and that no matter how many words she had access to, she wouldn't be able to derive meaning from them? But she could, initially. I was so confused and also there was the "what if" shadow there- what if it's too advanced, what if I'm expecting too much, what if she's not ready, won't be ready... the what if is a dark demon indeed. But we persevered, what ifs be gone. Then we had the issue that can be summed up as "when all the iPads died various but equally tragic deaths", which you can all I'm sure appreciate the meaning of. Did I mention that I was paying my college tuition about the same time? So after all this and once we didn't get rich, but did get approved for a student loan, the iPads were next on the must-get-items. The fact that Sophie was without an actual talker for over a month was making me feel very anxious. But I also knew that a talker itself was not enough- she needed a dedicated talker, this time not "dedicated but Felix will still use it when she's not communicating" but DEDICATED, dedicated. AND this talker was to be encased in a case that was evidence-proven to withstand tanks driving over it and tornados, hail and high waters or something like that. And so here we were. I documented it in this Facebook post here. Then I sent it to her school and took a deep breath of cautious optimism. And then magic happened. Sophie, seeing that Thomas is not threatened by the communication app, began to reach for it. She started off with the regular requests for juice, fruit, thomas, etc but also started to hit other buttons, not in error, but in curious exploration. She took real interest as to where words are and what they are. It snowballed from there- it's amazing how little feedback can surge a wave of new motivation through a household. We all began to model in earnest and for once Sophie is an active participator- reaching, responding and engaging with us. Her utterances show intent and of course learning still. Once in a while we get a genuine answer to a question, especially a "what would you like Soaps?" question- food, juice, etc. She's loving Costco's giant chocolate muffins and requests them often. Once she finishes her piece, she passes me the talker so I can press "more" and she completes the request with "muffin". We get a lot of talk about engines, today I added the words "smash", "crash" and "bash"and she began to use them instantly. Another thing is when I model a new word she attends to me showing her the path of how to get there- I added "swing" today and showed her several times that it is under "then". Might have to show her several more times but the fact she took interest- huge. And perhaps the most exciting thing is that when she's done with communicating (or anything really) she has the ability to press "stop" or "no" or "all done", or as demonstrated here, all of them at once. That's why I am doing this- sure I want to talk with her. But mostly I want her to be able to speak up for herself. So that's that. Close to 2 years after my overwhelmed post seeking solutions to Sophie's lack of voice and about 18 months after purchasing her app I finally feel that we are on the road to actual communication. When and how it will proceed, I won't even guess. But I'm betting it will be amazing. If ever there was an award for most negligent blog owner, I'd be sure to win. On another note, where does the time go? It's been about six months since I've updated here and to bring everyone to speed I'll summarize everything in about 80 million words. Not really. But probably close. The last six months have been big in Sophie's and my life. She graduated from preschool (sob), completed junior kindergarten, and learned many things. And I had my first job in about oh, 12 years! First the preschool. Given the global and anonymous nature of this here blog, I won't name it. Suffice it to say, it's a special place. And I had the unique experience of seeing through a parent's and an employee's eyes. The staff is truly one of a kind, the children are treated with love and respect, their unique strengths recognized and goals worked on in a gentle manner. It has a family-like atmosphere and it's no wonder parents have a (probably harder than the kids) time leaving it. If only the rest of the educational system worked like this. The kindergarten. Different scenario but all together good I'd say. The public school doesn't have the resources that the preschool has, but they did their best with what they had. The teacher was gentle and dedicated to her class. She had a very good EA too. Sophie seemed to mostly enjoy her year, save for a couple weeks of strange crying which we have deducted must have stemmed from seeing me in the mornings at the preschool (even though I did my best to stay hidden from her). Me- a volunteer position turned into a contract turned into a classroom support position until the end of the school year- wow. I'll be forever grateful for those opportunities, which I'm sure contributed to my acceptance to the Communicative Disorders Assistant program I will be starting in September! (The terms "eek!" and "gulp" pretty much sum up my feelings about that at this moment). On progress. This can be subtitled "in which Sophie does one thing while mommy is relentlessly pursuing something else". It's no secret that my main focus is communication. I believe it to be critical for her autonomy, her learning, her ability to self-advocate. Most of my learning, my research and advice-seeking relates to expanding her communication. Now, Sophie could always express her wants, which I know is amazing. When she was verbal, and shortly after her regression she could ask for what she wanted (now that I think about it, it's interesting she never lost that ability). But I digress. Sophie could always request things, using multiple modes but at this point we have not yet been able to move past requesting. Sophie's approach to her talker is very utalitarian, she gets what she wants and moves on, even throwing it to leave no doubt that as far as she's concerned we are finished talking. But it seems her interest lies in expanding her physical skills. Observing her especially outside it's as if she makes her own physical therapy goals- first I work on some stairs, then I jump and run on the trampoline, then i walk on this ramp, then back to the stairs. None of these things are easy for her! She loves to swim too. Her body is fitter and stronger and while she still has gross motor delays and low muscle tone she's steadily progressing ahead. I wonder if she would be so well-regulated if we didn't give her so much free time and freedom to self-direct. I'm sure if an OT had devised a similar plan for her she'd scoff and ignore it. She is learning and progressing at her own initiative. She also has the power of "no". She is able to communicate the message of "no", or "All done" (that's new!) and have it be respected. Her reluctance, pushing away what she doesn't want and her requests to be left alone are heeded and I hope that it also is giving her the seeds of self-advocacy. And a final thought. While we are working on her talker use and doing all the communication things, in my quest to leave no stone unturned I am also researching this -Rapid Prompt Method. It's popular with many autistic advocates and I've been reading this book and following some blogs and thinking how I can try it. If you are interested, I'd recommend you look up some videos on YouTube, especially of Soma Mukhopadhyay (the creator of this system). I have many more thoughts but I'll end it here for now (not writing a novel, after all). Now that it's summer I will try to write more often. 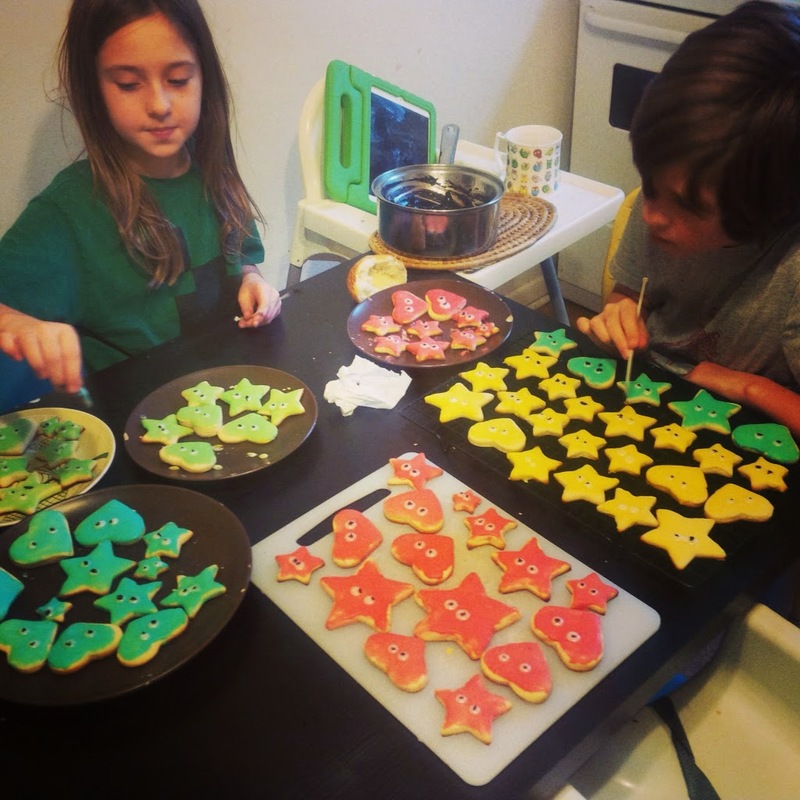 There is a pervasive ideology in the mainstream autism parenting and education community that when it comes to autistic children, you have to act fast. That if we are to teach our children anything, we must hammer it into them before a magical developmental window slams closed forever, leaving our children permanently shut out. This concept of the magic window started innocently enough when scientists began to observe the massive amount of learning that toddlers do, the type of brain growth and development that is never again replicated in our life and concluded (as scientists do) that naturally we must interfere with this process, by providing "stimulation" usually in the form of too-advanced and too-rigid activities such as overpriced contrasting rattles, various "educational" toys and videos named after famous physicists. While this type of interference is largely benign (if annoying and unnecessary) for typical toddlers, whose development is not under a microscope and who don't have to constantly try to catch up to their neurotypical peers, the philosophy of "maximum stimulation in minimum time" can do a great deal of damage to the autistic child. As I mentioned on Facebook, I have recently become a part of a wonderful blogging collective. Our goal is to write about living with, parenting and perceiving autistic children with gentle love, acceptance of their neurology and a celebration of their neurodiversity. Many talented writers are part of our group,and it's an honour to be writing alongside them. The stories might challenge common attitudes- but that is the goal. I believe some of my readers here would really enjoy it and I urge you to check it out. The following post appears in its entirety on that blog. Speech delay is often one of the first noticed signs of autism. 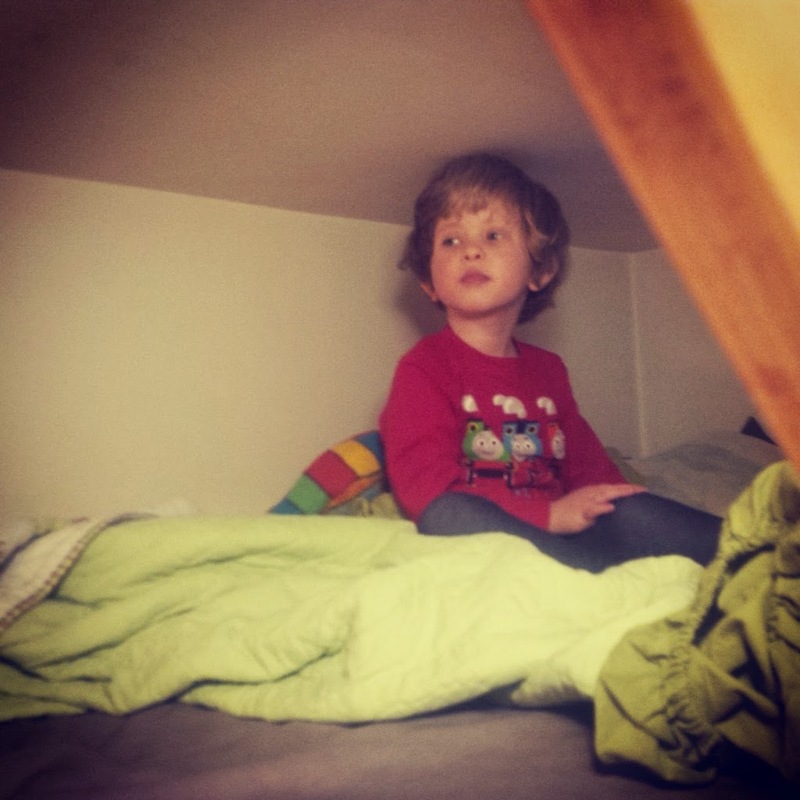 Young toddlers are diligently watched to make sure their speech is developing "as it should". If it doesn't, parents are usually advised to put them in speech therapy so that they might "catch up". Some do, some do to a certain extent and some don't at all and they are usually referred to as "nonverbal" or "severe". It is true that an atypically developing speech often signals an atypical brain. 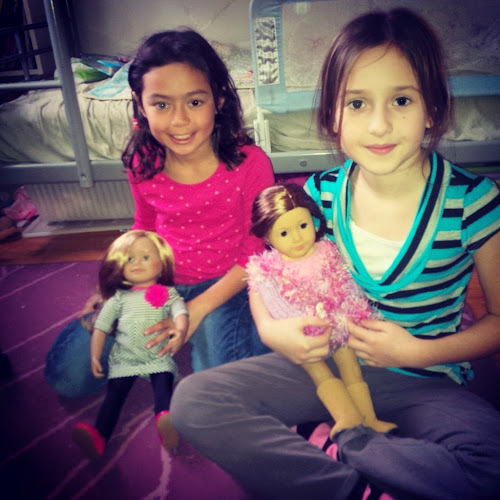 Being parents of a four and a half year old girl who used to speak and now doesn't, we have spent a lot of time pondering why she doesn't speak anymore, how we can help her communicate and even what she could be thinking. I always felt that my quest to help her communicate was a worthy and imperative goal. I haven't abandoned this philosophy but have recently realized that like most everything with Sophie, it's not quite so simple. It's been too long since I wrote here. Perhaps my New Year's resolution should be to blog more often. I do want to take the time to sum up this year, and reflect on some big events in Sophie's life. If there is a corresponding blog post to each story I will link it for your reading pleasure. Oh, that's been a long time (and yet by some standards, not long at all) coming! 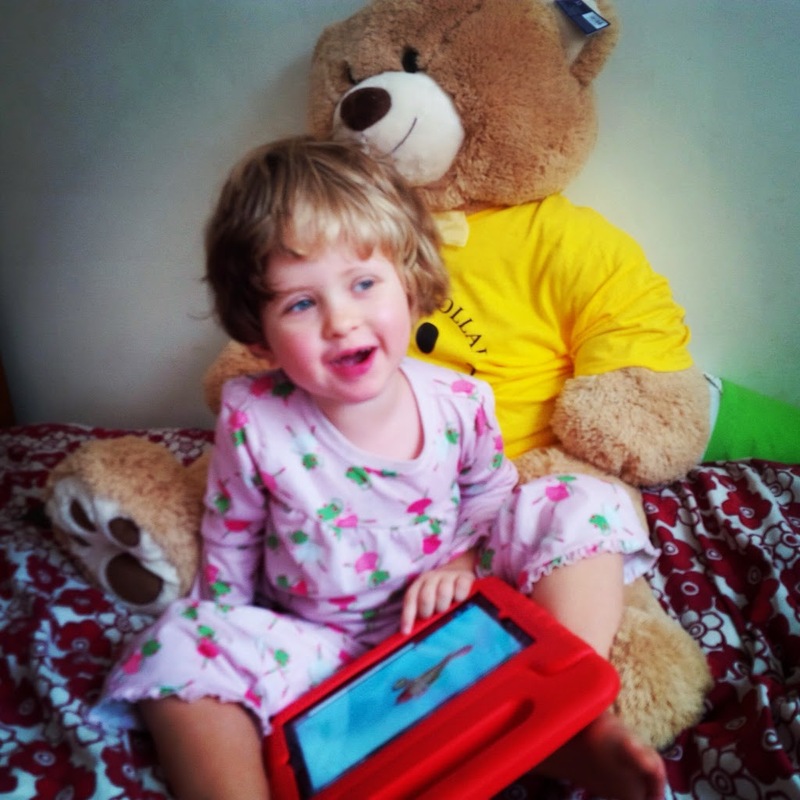 Within months of Sophie losing her speech at 2 I was already researching ways for her to communicate. Perhaps because she did use to speak I felt the matter was of critical importance? After all, her communication (verbal and nonverbal) was already pretty advanced at that point and suddenly just vanished. I felt that loss as much as I was sure she did. 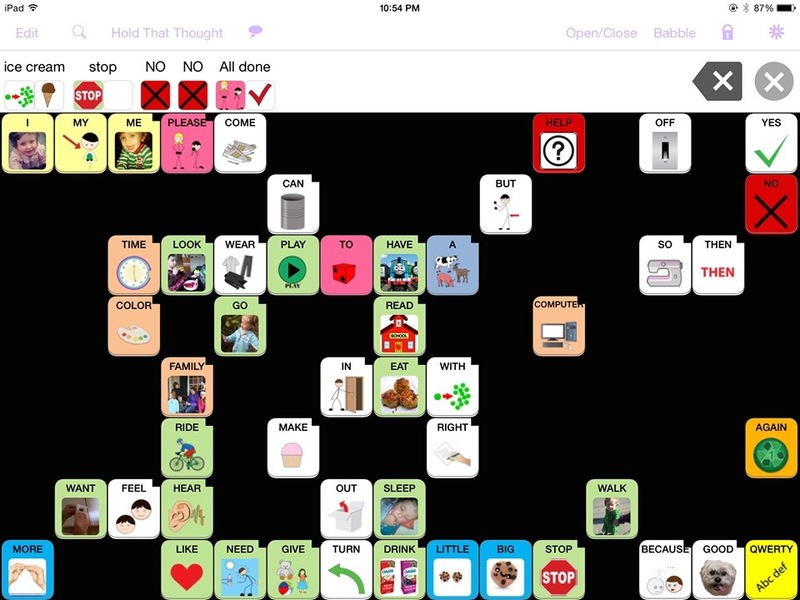 PECS bridged the gap and the communication app (Speak for Yourself) is continuing to make a difference. Is it a linear, measurable progress? Not by any means. But I figure every word, every utterance that she can say, even once a day, (once a week!) is more than she could say otherwise and therefore a worthy cause. Sophie's communication continues to develop. Many of her nonverbal communication skills have re-emerged. She is able to use eye gaze very well to show a desired item. She continues to use the picture cards to show us what she wants. Sometimes she places our hand where she needs assistance, even to show pain as of recent (she placed my hand on her ear after a night of crying. It was a bittersweet moment when I realized she was in pain all night and I didn't know, but at the same time amazed she was able to show me). Single words have been heard repeatedly and by several family members. Aside from the regulars- "go", "up" and "baby", "ipad" has been a clear new word. She continues to babble and vocalize constantly and appears to be able to reproduce all sounds without an issue. Regardless of what (if anything) happens with speech, we honour each and any way she communicates, understanding the immense effort and initiative (which she has trouble with) they require on her part. Another piece of our naïveté was lost when we realized that going to kindergarten was not just a matter of going down to the school our older kids went to and signing her up. That was only the first step which set the special education machinery into motion. This was followed by a meeting with a special education committee where Sophie was yet again reduced to a stack of forms outlining her seemingly mediocre (on paper) school readiness skills. Thankfully her OT from her preschool attended to add a bit of "flesh" to the long chart of "not yet doing this skill". It was decided that Sophie would do best in a small classroom of special needs children (what is called a diagnostic kindergarten here in Ontario). Camping is our annual vacation. It was always a week for us to get away and connect in a peaceful setting. All the other kids love it and we were nervous how Sophie would cope, especially without her ipad for over a week. She did amazing! Aside from realizing that we do need a proper, large stroller for her (that's been taken care of now), she was calm, found her own ways of self-regulating and just loved hiking and swimming. We are already planning our next trip! While we were obviously nervous and a bit dejected that our Soaps has to be shipped out of the neighbourhood to her school it turned out the best it could have. 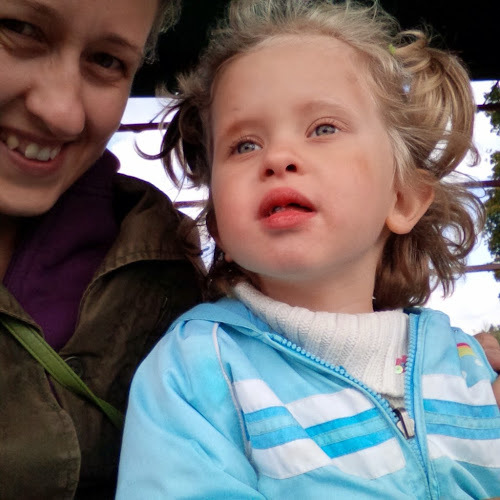 Sophie continues to attend her special needs preschool in the mornings (where she receives many therapies) and then takes the bus to her afternoon placement- and she loves it. Her adaptability is another one of her strenghts. She just goes with the flow and makes the best out of each situation. Her teacher and EA's are sweet, dedicated ladies. And in an odd coincidence we found out that her teacher from her "far from our neighbourhood" school actually lives just half a block north of our very own street! Sophie has always been a diagnostic puzzle. Amazingly for about 18 months we had not realized that she was not typical. In retrospect we did notice certain things which I guess we didn't want to notice, or tried to rationalize them away. This was not so difficult since all our concerns were dismissed by her paediatrician as "her own curve". She was born quite large (9.5 lbs) but for a third child it was not too unusual. Her head circumference was also large (40 cm) but that was also somewhat not alarming. She was on the late end of reaching physical milestones but yet kept progressing forward. Many of her delays were in fact explained by her large head (which seems silly now. Nobody has said low muscle tone, it's so obvious now and always was). Her emotional and social development was ahead of schedule. By 18 months she had more clear words (in two languages!) than any of her siblings. That's what lulled us into complacency. Clearly her intellect was intact, what's a little gross motor delay? None of us are athletes anyway! (I should add except my older daughter. She would be offended to be counted in the non-athletic camp). We now know that any neurological delay should be taken seriously as it could signal major things. Long story short, after the regression an array of tests, spanning over a year followed. The MRI uncovered the brain malformation (Polymicrogyria). Then months of waiting for confirmation while her samples were analyzed in Seattle for the rare genetic mutation. And finally this September it was confirmed that she does indeed have the mosaic mutation of the gene which is responsible for the brain malformation, the large head and few other symptoms. We feel lucky and grateful her symptoms are relatively mild. Any concerns we have for her future health are pushed away and not dwelt on- enjoy the present, worry about the future when it gets here is the motto in this situation. Worrying about what might happen won't help Sophie now. 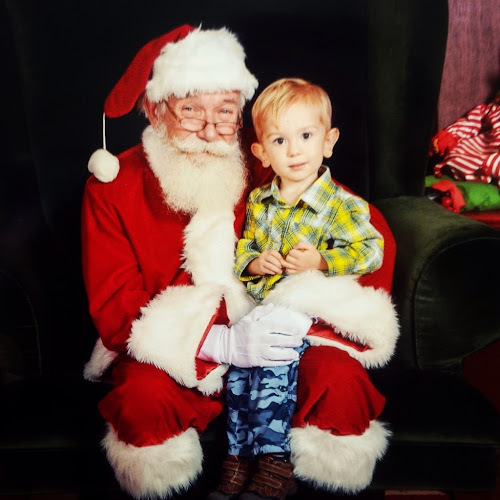 Santa (working for a children's charity who got involved in Sophie's preschool) also came in person to our home to drop off a gift certificate and four giant bears. Two of them have since been re-homed. And that brings us to the now. We are currently in the second week of our 2-week winter holidays. We are having a wonderful break. Our family is very low-key (boring? But that's how we like it). Simple gatherings in the very familiar homes of grandparents over the Christmas days. 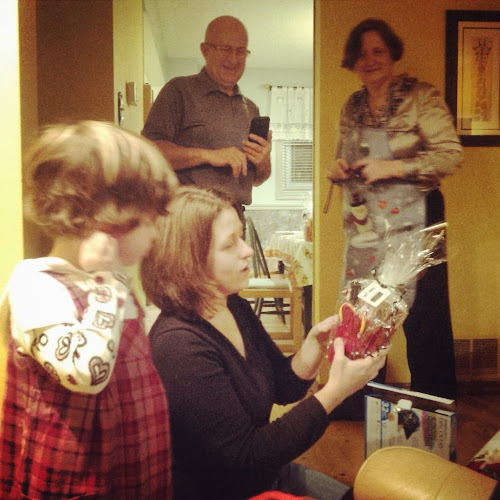 Dinners, presents, family. The atmosphere was very casual and Sophie coped very well, but then she's always pretty laid back anyway. There's not much expected from her other than showing up, and she does like yummy treats. And of course Thomas on the ipad. We visited a few friends with children on two separate occasions and she was a quiet champion there too. She also had a sleepover with her older siblings at one grandma's house. We took little day trips, taking advantage of our memberships to two popular family attractions. One was an early-settlement village we just love to visit. They had some old Victorian Christmas holiday traditions we enjoyed seeing and learning about. 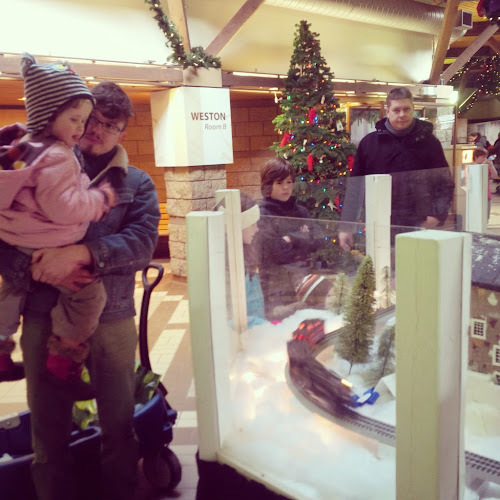 The highlight was seeing Sophie mesmerized by an electric train going around a gingerbread village display. We also planned some dates with the two big siblings alone. They are truly awesome kids. They never complain or moan about their little siblings who do take up a lot of our time and attention. They help out a lot with their siblings without being asked, especially when we are out and about (and need help the most). Any time we can give them a little treat or spoil them a little, we do. So we took them alone to a big science museum. It was easier to navigate without keeping track of the babies, making sure they are not getting lost or running away (although we did manage to get separated for a good 20 minutes, so take that as you will). They had a sleepover alone at their other grandma's house and tomorrow (New Year's day) we are planning to take them to the movies. I also scheduled a lot of play dates for them this week (pretty much continuously actually, it's a play date revolving door) but surprisingly that doesn't bother me. Like I said, they're great kids and so are their friends. Now that they're older play dates are less running around and making a mess and more lego and computer (for the boys) and American dolls and lallaloopsies (for the girls). Felix likes the attention of the big kids and Soaps... Well she's been hanging out in her brother's loft bed this past week happily removed from the action but yet looking down at all of it, just how she likes it. I'm so excited to be taking the first step towards my future career in special education. I have started a volunteer position at Sophie's wonderful preschool which turned into an offer of a 60-hour paid contract starting right after the break. I will also apply to school for the fall and see how it all comes together. It's just the start of the journey, but I'm so ready and excited to take these first steps. I want to thank the readers who have read and commented on this humble little blog. I write this story for Sophie mostly, but am so grateful for the feedback and encouragement I get from all of you. I wish you all a happy and peaceful 2015, may it bring whatever you dream of for you and yours. When the call went out for submissions to the #IamNotKelliStapleton flashblog, I almost decided not to participate. The Kelli Stapleton case has polarized the autism community (even more than it was already) and shattered any fragile peace that existed prior between autistic advocates and their supporters and some (vocal) parents of autistic children. I remained quiet through the initial incident and the first shockwave. I didn't comment on the trial and the infamous dr. Phil interview. I restrained myself when a blogger suggested "we are all Kelli Stapleton". However when I read this article last night, it pushed me over the edge. Those parents who have supported and even identified with Kelli Stapleton up to this point surely cannot now- following an objective, mainstream-targeted, third-party piece of writing, not skewed towards the point of view of autistic advocates (in fact containing some very ablist views, but we've come to expect these from the media sadly) and yet despite all its shortcomings, the image of the character that emerges by the end cannot be viewed as sympathetic. If someone reads it and still thinks that they could be Kelli Stapleton, they should seek some counselling I would suggest. What has struck me about this case since the beginning is the obvious physical similarity between the victim Issy and my Sophie. Sophie could be Issy in ten years- a cherubic round-faced girl with pale blue eyes and blond curls. 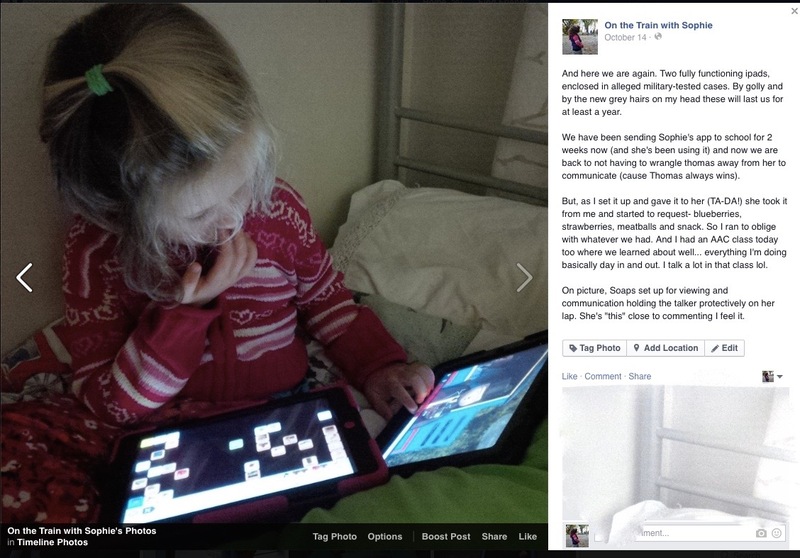 Sophie was also diagnosed at 2, following a regression as our readers know. Yes Sophie could be Issy except for one thing. Yup you guessed it; I am not Kelli Stapleton. tracked down a child psychiatrist in Michigan and essentially dedicated all of her waking hours to the Issy- project. All of her waking hours. That's a lot of hours. Remember, Issy was two at the time. How does one go about "curing" one's child of autism with ABA? From the minute Issy woke up until she went to bed, Kelli subjected her minor routines to rigid control: Kelli would say, "Touch your nose," and when Issy did it she gave her a little prize. If Issy wanted something, she had to look Kelli in the eye to get it. Sometimes Kelli had to make the same request ten or 20 times in a day, because an autistic child finds it hard to tune in or follow instructions or make eye contact, much less do it all day. By the end, she’d be pleading, desperate, "Dear God. Touch your nose! Your whole future depends on this!" All of her waking hours. we do wonder if we really want her to be drilled for 40 hours a week, rewarded with a tidbit of food for each socially appropriate gesture she is able to replicate. Perhaps in this case the waiting list is a blessing, buying her some more time to just "be", regardless how unproductive her just being is seen as through the prism of ABA. I wonder if Kelli Stapleton ever took the time for a similar reflection or whether the objective of "recovering" Issy overshadowed any other concerns for the toddler's well-being. Aside from the fact that I think it's wrong (yes I said that. I don't feel disagreeing with the type of treatment Issy received all of her waking hours is just a difference of opinion. I think it is a wrong thing to do to your child and fellow human being), I will tell you something else. I am absolutely certain that if we subjected Sophie to this type of "therapy" she would lash out physically. And could I blame her? If someone is constantly "in your face" micromanaging your every movement and decision, does that person not become an oppressor, an abuser? Would you not despise them and foam with rage at the mere sight of them? I don't doubt the fact that Issy was aggressive. Unfortunately I cannot say how she would turn out if she was not raised by a narcissistic mother who never accepted her as she was. It is very possible that she would be prone to hitting when frustrated, perhaps biting. It is impossible to say for sure however, because she was not raised in a home where she could be herself and learn to manage her emotions in a loving and accepting environment. She was singled out and punished for her disability, separated from her siblings to endure the therapy that continually sent her the message that she was not enough. 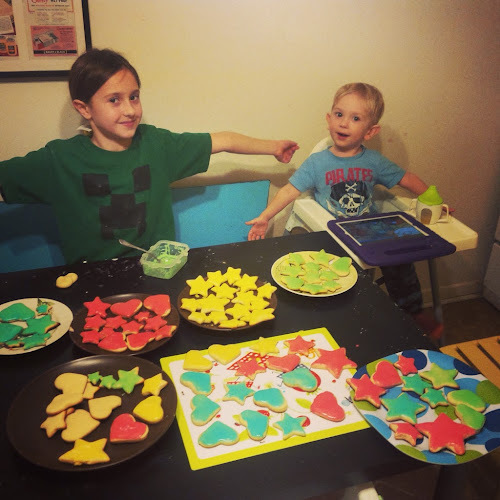 For three years, she became Issy’s full-time teacher, enrolling her other two kids in day care and sending them, on evenings and weekends, to the houses of relatives. How am I not Kelli Stapleton? When I wanted to engage Sophie I did the opposite. We include Sophie in everything we do as a family. We avoid separating our kids during family time without a very good reason. We constantly brainstorm which activities would be most suitable to all our family members, who are all of different ages, ability levels and at varying developmental stages. It is difficult sometimes but not impossible. Why do we "bother"? Because we are a family. We all matter. First thought that came to me- I am sad about the "would-be's". She would have been a cute little chatterbox, would have loved animals, would have played with her brother and sister, would have gone to the nursery school her sister attended, would have play dates with the little girls her age on our street... And I realized- it's not about Sophie. It's about me. All those "would have's" have meaning only because I attached meaning to them. Based on my interests and desires I have formed an image of a cherubic little toddler I would have expected Sophie to be- but it isn't Sophie. If I was a different sort of mom I'd be mourning the loss of a would-be ballerina or a would-be soccer player or a would-be artist. Sophie isn't mourning the loss of those dreams because they were never hers to begin with. As parents we fantasize about what our children will grow up to be. It seldom comes to pass as children pave their own reality (as they should). Yet, when their reality falls outside of what we consider desirable, we reject it, or fight it (it's not just about autism, in some families it could be going against the family profession, or marrying the wrong person, or being the wrong sexual orientation). Now, I believe if a part of us is still mourning the loss of the child that's "buried under the autism" then that can lead down a destructive path. I've heard people yell at autism, swear at autism, banish autism out of their lives. That goes with the presumption that autism is sort of like a growth that is fused to the typical child's brain and that, with proper handling can be removed, leaving the perfectly intact brain exposed. I choose to see that autism is as much of Sophie's identity as her blue eyes, her infectious grin or her funky hair. You can't excise it from her and uncover a neurotypical Sophie which was hiding there all along. If I claim to love her, I can't make qualifying statements like "I love my child but I don't love her autism". It's like telling me "I love you but I don't like your introvertness" , or "I love you but not your green eyes". I have to think and say "I love you, all of you, exactly as you are". 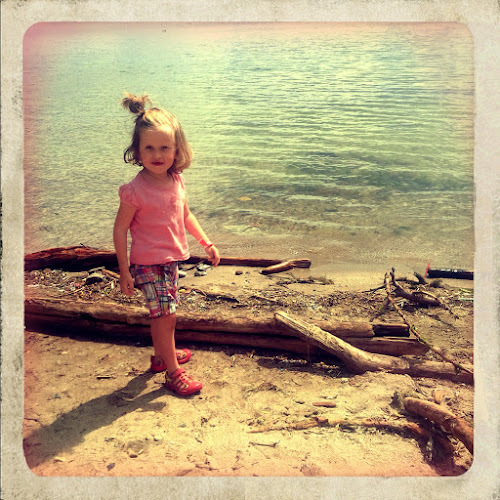 You might wonder why I chose to focus on Issy's early years and not on that fateful day last September. I happen to believe that Issy didn't stand a chance well before her mom planned and attempted to end her life. Way before she chose to record her sardonic observations on social media. Issy's fate was sealed as soon as her mother realized that her child is different than she expected and she refused to make peace with it. I am not Kelli Stapleton. Regardless where our journey takes us, regardless what obstacles we will need to overcome, Sophie and I will do it, together. There will be reflections on this blog. There will be thoughtful idea-seeking. There will probably be admissions of wrong-doing. But you will not read snarky comments directed at my daughter or her neurology, those who share it, the problems that aren't hers to be burdened with or intimate information that should be private. This is her story, recorded with love by her mom and her biggest fan. I will be honoured if she chooses to read it one day. New funding for same old services? I'm the mom of four children, including 4 year old Sophie who was diagnosed with autism at 2. This blog started as a way to process my feelings regarding the diagnosis and chronicle Sophie's progress. It is gradually evolving into the story of Sophie, an amazing little girl who surprises us everyday.